Paul Goins has been writing software professionally since 2005, minus a two-and-a-half year break to teach English in Japan. He has been working professionally with Python since 2008, is proficient in many other languages, and most recently is turning his focus towards Erlang. Paul has worked both in Japan and the U.S., and presently resides in the Greater Portland area in Oregon. Going to try to keep this quick. For those who know me in real life, I’m overweight. Since graduating college, I’ve been as high as around 320-330, and as low as 182 (thanks to watching what I ate somewhat and doing excessive amounts of Dance Dance Revolution and In The Groove). My weight settled around 220 lbs in Japan (which is noticeably overweight there), and around 260-270 here (which is noticeably overweight anywhere). Anyway, I’ve been struggling to lose weight again, especially since I don’t have the freedom to do 3-5 2+ hour Dance Dance Revolution workouts a week like I used to. However, my weight has continued to creep up. I was around 260 at the beginning of this year, and was almost 268 until about a week ago. 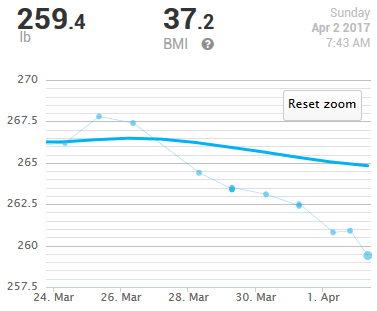 As of this morning, I was 259.4. The second lowest weight I’ve clocked this year. Along with this, through watching videos on London Real, I’ve been exposed to Wim Hof, “The Iceman”. I’ve also seen the VICE documentary about Wim, which got me genuinely quite interested in him and his method. The basic method is explained in freely available documents online, however there is also a 10 week course on the method that is sold on wimhofmethod.com. Since it’s on a Christmas sale and I had extra money on a company gift card, I decided to give it a try. I’ve had a chance to take a look at a few of these. And while personal time constraints have reduced my ability to rate editors in the way I originally planned, I’ll at least provide what details and opinions I can. Lately, largely in response to exposure to some refactoring and programming style books, programming videos, and recent experiences at a code retreat, I’ve been beginning to reconsider my editor of choice.